The Stanton House Inn is a converted mansion that is now a bed & breakfast Inn, located in the prestigious village of Greenwich, Connecticut. The Stanton House Inn offers elegant surroundings, comfortable rooms and a satisfying continental breakfast at rates competitive with commercial hotels in the area. The rooms are bright and cheery, decorated primarily with Laura Ashley-style fabrics and period furnishings. Rooms: 2 suites, 21 doubles I single 22 w/private bath/or shower, 2 rooms w/shared bath. All w/telephone, radio, desk, and air-conditioning. many w/ refrigerator; 2 with working fireplace 2 w/private deck. Location: Take exit 4 off I-95 go N (left off the exit from NYC, right coming from New Haven) on Indian field road, go about a mile to Putnam Avenue. Go left about 1 mile to Maple Avenue,on the right. Look for a large stone Second Congregational Church on the same side. Take the "hairpin" turn to the right infront of the Church, continue on Maple Avenue about 150 yds. The Inn is on your left. Restrictions: The Inn is entirely non-smoking and children over the age of 7 are welcome. This and other Greenwich Bed and Breakfast Inns can be found here in The Register. 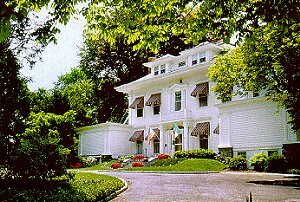 Romantic Country Inns, Getaways and B&Bs offer a great Connecticut lodging alternative to big hotels.